For electronic musicians who still like being able to perform with dials and buttons, Teenage Engineering’s Pocket Operators are miniature synths that manage to pack a tremendous amount of functionality into a tiny package. And that now includes the ability to import and export sounds and patterns with the new PO-32 Tonic synth. 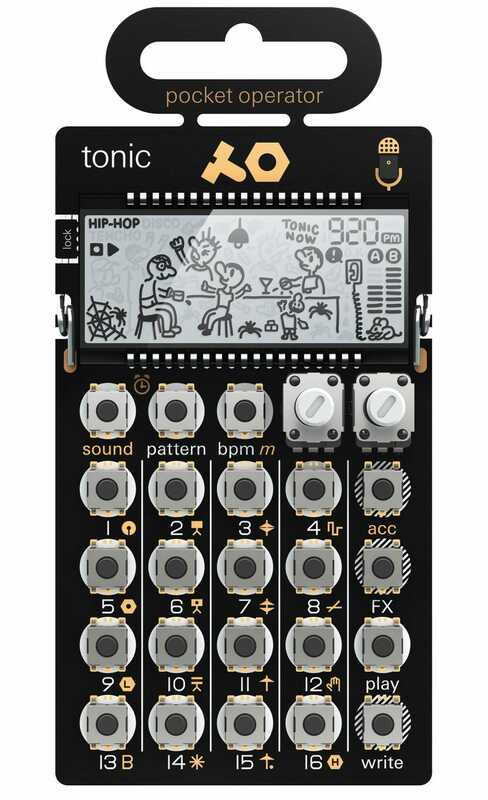 Developed in collaboration with Magnus Lidström, who contributed to the original versions of the Pocket Operators, and wrote a software drum machine and percussion synthesizer for Windows and Mac called Microtonic, Teenage Engineering’s new PO-32 Tonic shares part of its name because it’s essentially a hardware version of Magnus’ app. As with the other Pocket Operators that have been available since 2015, the PO-32 Tonic features 16 sounds, 16 different punch-in effects, a sequencer that can chain up to 64 patterns, a full month of battery life on just a pair of AAs, a charming old-school segmented LCD display (with a clock), and the ability to sync with other Pocket Operators for jam sessions with friends, or just creating a more complex beat. What sets the PO-32 Tonic apart from past Pocket Operators is the new version now has the ability to import and export sounds and patterns via its 3.5-millimetre line-in jack, or through its new built-in microphone. The PO-32 Tonic is actually designed to work with Magnus Lidström’s Microtonic software, allowing the desktop app to be used to tweak sounds, effects, or generate patterns that can be digitally transferred to the tiny synth using audible sounds reminiscent of dial-up internet. Remember those weirdly-satisfying garbled sound effects your modem made as it logged on to the early version of the world wide web? The new PO-32 Tonic does the same thing to transfer data between units or a computer, so you don’t need to keep USB cables on hand, or rely on a battery-draining wireless connection. The PO-32 Tonic synths can also talk to each other in the exact same way, allowing users to easily share sounds and patterns between units, which should make the newest Pocket Operator the best way to actually learn how to use the tiny synths.